New Thomas & Friends episodes start on Saturday, September 1st (check your local listings). PBS KIDS will also broadcast the new 60-minute Thomas & Friends special Blue Mountain Mystery. In this all-new adventure, viewers will travel on an exciting journey with Thomas and his engine friends tracking down clues, discovering a lost engine and revealing the power of friendship. The action-packed special airs in November (check your local listings) following its September 18th release on DVD from HIT and Lionsgate Home Entertainment. Timeless tales of friendship and adventure on the Island of Sodor are brought to life in the CG animated Thomas & Friends series. One of the upcoming episodes airing this fall (#908 – “Welcome Stafford”) introduces the new character, Stafford, an electric shunting engine. The episodes also highlight the Narrow Gauge engines and the Blue Mountain Quarry destination, featured in Blue Mountain Mystery. 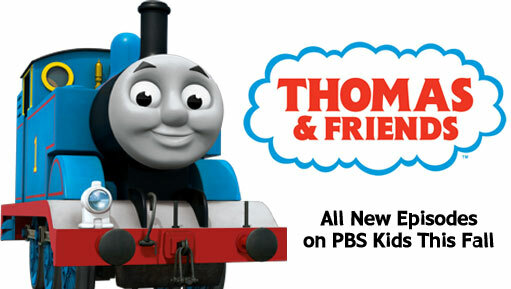 Currently, Thomas & Friends is the #5 ranked non-movie K2-5 series on PBS (Nielsen, June K2-5 Live+7day). Episode #906 – A Friend in Need! The Monster of Brendam Docks – Percy is waiting at Brendam Docks to pick up a new table and chairs for Dowager Hatt’s house. Fog rolls in, and legend says that’s when the Monster of Brendam can be seen. Percy tells the other engines about the legend and causes chaos around Sodor when the engines mistake each other for the Monster! Flash Bang Wallop – A photographer arrives to take photographs of the engines for The Great Railways of Sodor book. Thomas is determined to be photographed more than Gordon and bursts his way into each photograph, not realizing Percy and James have become derailed. A cross Sir Topham Hatt tells Thomas about Percy and James being derailed, and Thomas has to find a way to put everything right. Salty’s Surprise – Salty tells the other engines that he just likes a good story instead of holiday presents. Still determined to find Salty a present, Edward finds all different kinds of gifts for Salty, but Salty says no thank you to each present. Salty points out that Edward has given him a story — which is, for him, the best holiday present of all! Welcome Stafford – Spencer is proud to show Stafford, the new shunting engine, around Sodor. Stafford is an electric engine and runs on batteries. Stafford tries to tell Spencer when his batteries are running low, but Spencer doesn’t listen. Soon, he finds that Stafford is not behind him anymore — his battery has run out! Later, when Spencer runs out of coal, Stafford shunts Spencer all the way to Knapford Station! Don’t Bother Victor – When Mr. Percival leaves Peter Sam in charge, he tells Peter Sam not to bother Victor with little things. Soon, Sir Handel starts creaking and croaking, Skarloey’s funnel fumes and Duncan’s rods rattle. Peter Sam tries to fix them all himself, instead of bothering Victor. Then Peter Sam runs out of coal and he hasn’t fixed the engines. He realizes that broken engines are not ‘little things’! The Christmas Tree Express – Rheneas wants to surprise the other engines at the Blue Mountain Quarry with a Christmas tree, and he asks Toby to take him to Misty Island to get one. On Misty Island, Toby wants to travel slowly, but Rheneas is excited and in a hurry. Speeding along, Toby and Rheneas whoosh straight past some perfect Christmas trees. Rheneas realizes that he has been silly to rush. With the help of the Logging Locos, they take the best tree of all to Rheneas’ Narrow Gauge friends! Ho Ho Snowman – To show Henry that snow is fun, Charlie hides behind a snowman and pretends to be the snowman telling Henry jokes. Henry is scared and steams quickly away. Charlie is sorry that he scared Henry and realizes that not everyone likes the snow. Charlie sees what makes Henry happy in the snow: quiet, natural things. Then, Henry asks Charlie for a joke, and they both enjoy a good laugh! Express Coming Through – Dowager Hatt is having a “Welcome to Sodor” party. Sir Topham Hatt asks Thomas to take the visitors on a tour of the island, but the Express that the visitors ride on is too heavy for Thomas. He doesn’t want Gordon to see that he has to drop off the passengers to make the Express lighter. When Dowager Hatt realizes that the visitors are missing, Gordon is sent to collect them. But there’s a job that still needs to be done! Thomas is fast and picks up the balloons for the party proving that that he is Really Useful, just in a different way than Gordon! Whiff’s Wish – Whiff is given the job of collecting trucks of garbage from across the island. Whiff hears Spencer being praised for his grandness. Whiff wishes that he, too, could be a grand engine, so he searches for opportunities to be grand. The tracks come to a standstill because Whiff’s garbage trucks have not been collected. Worried, Whiff crashes into Percy. Seeing Percy, who is only concerned about delivering the mail on time, Whiff realizes that there is nothing grander than doing your job well.